Jindo, South Korea (CNN) — South Korean authorities arrested three people Monday on suspicion of destroying evidence connected to the sinking of the ferry Sewol. Investigators also raided a Coast Guard office in a probe of how officials handled the first emergency call from a passenger. The director and two other people with the Korea Shipping Association’s Incheon office were arrested and accused of destroying evidence related to the probe of Chonghaejin, the company that owns the ferry, prosecutor Song In-taek said. The Korea Shipping Association is a trade group that promotes the interests of the country’s shipping industry. The site raided was the Coast Guard building in Mokpo, which includes the South Jeolla province emergency center — a facility that provides 119 services, akin to the 911 emergency service in the United States. Investigators are looking into possible dereliction of duty, said Yang Joong-jin, the chief prosecutor in Mokpo. 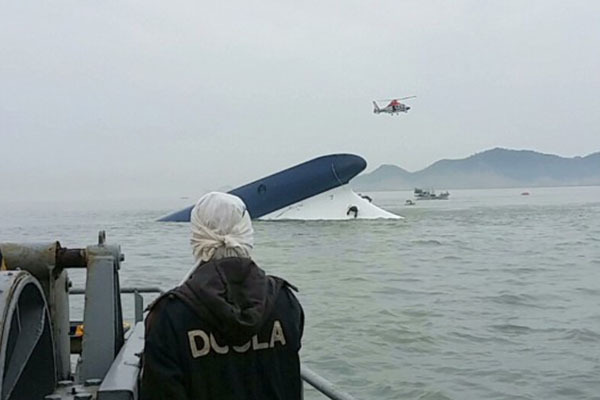 Police and prosecutors seized documents and recordings from the day of the ferry’s sinking, state-run news agency Yonhap reported. The office received the first distress call from the ship when an 18-year-old boy dialed the 119 emergency number, the report said. “According to a transcript of the recording, a Coast Guard official asked the student to provide the latitude and longitude of his location, sparking criticism that authorities wasted crucial minutes before starting a rescue operation. The investigation team said it will analyze the work journals and transcripts of the recording to see whether the authorities properly fulfilled their duties,” Yonhap added. The arrests and raid follow a spate of detentions since the ferry disaster off the country’s southwest coast on April 16. Nearly 200 bodies have been found, and more than 100 people are still missing. The ship’s captain and 14 other crew members have also been arrested. Prosecutors in Mokpo said all 15 crew members in charge of sailing and the engine room have been indicted and are being held in the Mokpo prison. Newly released video from the Coast Guard shows the captain of the ferry, Lee Joon-seok, being rescued in his shorts by Coast Guard members. At a press conference Monday, two Coast Guard members defended Lee’s rescue. Capt. Kim Kyung-il said he didn’t know he was helping the ferry’s captain escape the ship. Coast Guard member Kim Yong-ki said it was difficult to distinguish between crew members and passengers. A teenage boy who died on the sunken ferry captured these desperate moments on cell phone video, according to South Korean national TV network JTBC. After the boy’s body was found, authorities gave his father his cell phone. Its memory card was still intact. But the father couldn’t bear to watch the entire clip from the doomed ship. Instead, he gave the video to JTBC, which shared a roughly three-minute audio clip with CNN. In the video, some appeared to take comfort in the fact they were wearing life vests. “I’m wearing the life vest,” one passenger says. “I’m wearing one, too. I really have to,” another replies. But the life jackets didn’t save everyone. Over the weekend, divers found the bodies of 48 girls — wearing their life jackets — pressed into a room too small for so many people. South Korea’s Prime Minister announced his resignation Sunday, taking responsibility for the slow initial reaction to the ferry’s sinking. Prosecutors have said that authorities have yet to determine what caused the sinking. But leading theories include changes made to increase the ferry’s passenger capacity, and shifting cargo.